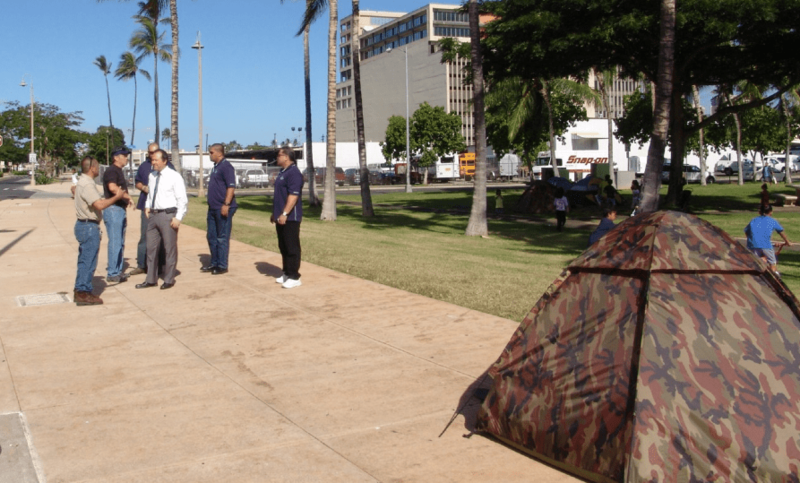 In Kakaako Tom talks with Utu Langi, Executive Director of Next Step Shelter, Kakaako Waterfront Park. BY TOM BROWER – When a natural disaster strikes and people become homeless, government reacts quickly to provide them shelter. Why should the response be any different during an economic crisis that gives rise to homelessness? In the past three years, I have traveled outside Honolulu to New York, Boston, Los Angeles and Hong Kong. Guess whose popular tourism spots have the worst homeless problem? The reality is we will never be able to build enough shelters to house the State’s 4,000-plus homeless and it is inhumane to keep shuffling them around. “No loitering” laws only work when people have a place to go. On the flip side, government needs to remove the homeless from areas of aesthetic, cultural and economic importance for the enjoyment of residents and visitors. Hawaii residents are frustrated with government’s lack of response to this issue. Yet, whenever I talk to city and state officials, they always tell me they are doing a great deal. Perhaps they are only helping a certain type of homeless and not the more challenging and visible type, the chronically homeless, who refuse to go into shelters. Our homeless problem has evolved; so too must government’s response. It is time for the Mayor’s and Governor’s Administration— the latter of which established the Kakaako Next Step homeless shelter — to take another step. How can government continue using the same failed strategies to address homelessness? How is this different from the definition of ‘insanity’ (keep doing the same thing with the expectation of different results)? As a legislator I understand first-hand that chronic homelessness does not offer easy solutions. The best place to start is often the simplest. I propose safe zones as a short-term, reasonable and do-able solution until things change and the number of homeless decrease. While not a new idea, I explored the feasibility of this solution this past legislative session, after speaking with advocates and service providers to address residents’ complaints about homelessness. With the adoption of H.R. No. 62 (2010) by the House of Representatives— and continued community-sponsored discussions— homeless safe zones are being recognized as a cost-effective, compassionate alternative to homelessness. 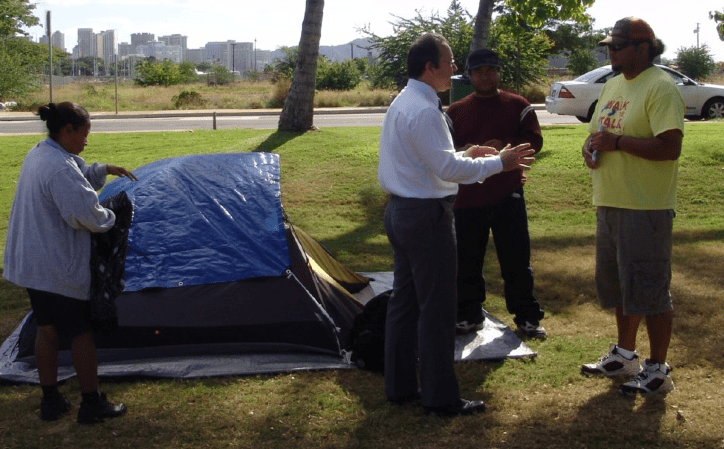 With police officers and homeless advocates, Kakaako Park, January 2010. I cannot force the State or City Administrations to follow my plan; I can only hope they see its value. We know where we don’t want the homeless to be because they are already “camping” there, illegally. We can either designate areas where the homeless can be— or do nothing and let them continue to be everywhere. If enough safe zones are created, the homeless cannot say they have “no place to go” and continue monopolizing our parks and sidewalks. They will now have a place to go. Should they choose not to go there, the homeless must understand, from this point forward, they will not have unlimited access for “camping” at popular spots. Being homeless should mean fewer options on where you can stay, not more. For homeless service providers, safe zones would make it easier to track/ care for their clients and control the spread of infectious diseases, like hepatitis. For law enforcement, the homeless would be easier to remove from unauthorized spaces. We have the manpower. Experienced and knowledgeable people— such as service providers, church groups and other volunteers— stand ready to help implement the safe zones. All we need is the land. A pilot program could be implemented and tailored to whatever area is first identified to gauge the level of success before expanding to other parts of the State. Rules would be established to restrict “camping” to certain times and provide safety for safe zone residents as well as the community housing them. A minimum of amenities could be provided, such as ‘reasonable’ night security and bathroom facilities. Whatever shape the solutions take will be no worse than what we have today. Democracy is at its best when challenges are embraced instead of avoided as has been the case with chronic homelessness. In reality, it takes just as much energy to put up with or avoid problems as it does to fix them. I encourage the community to keep sharing their concerns with government officials until better results are achieved. Elected and appointed government officials, who have endless energy to campaign, need to maintain that energy level once in office to seek better solutions to our community problems. Rep. Tom Brower, D-Waikiki, Ala Moana, Kakaako, is a 28 year Waikiki resident. Instead of using a sledgehammer against the homeless, why don't you do something constructive — like fixing the causes of homelessness. Now that would be worthwhile! It's atrocious that anyone would think demolishing a cart would solve any kind of problem of homelessness. Obviously, someone hit him on the head when he was born. He needs to rethink his strategy, or maybe rethink his being a representative of the human race.